The Nowata County Commissioners accepted the resignation of former Sheriff Terry Sue Barnett at an emergency meeting on Wednesday morning. Mirta "Mickey" Hallett was appointed as interim Sheriff. Hallett says that she already has plans in action including the hiring of new deputies who could be back on the streets as soon as Wednesday. Hallett has nearly 30 years’ experience in law enforcement including several years as the Nowata County jail administrator. Hallett is married to former Nowata County sheriff James Hallett as well. Hallett says her plan is to update the jail but there is no timetable for the return of inmates. Commissioner Burke LaRue abstained from voting on the appointment of Hallett. LaRue said his decision was in protest of the proceedings over the last few days and not a vote of a disapproval for Hallett. LaRue was emotional while reading a statement outlining his concerns. Barnett had received an order from Judge Carl Gibson to repopulate prisoners back into the Nowata County Jail which had been unoccupied since February 28 due to a carbon monoxide leak. Barnett had been adamant that conditions of the jail were unsafe. Barnett opted to resign instead of following Gibson's order. All law enforcement staff for the County also opted to resign. You can find that story here. 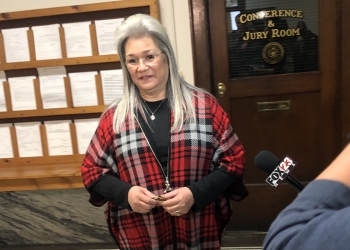 On Tuesday, in a heated hearing Judge Gibson made his case that the jail needed to re-open or the County would be driven further into financial trouble if Nowata County continued transporting prisoners to other counties. Barnett was silent while her attorney Paul Demuro engaged in a verbal spar with Judge Gibson over the terms of the hearing. Ultimately, the administrative order hearing ended with no clear conclusion. You can find more on yesterday's hearing here. Chairman Doug Sonenberg says he believes the hiring of Hallett will be a calming presence in the county. Hallett will fill the rest of the Barnett’s term until the next general election. Hallett is the fourth Nowata County sheriff in a period of less than two years.